nmcli c add connection.id "My Connection"
nmcli c add con-name "My Connection"
nmcli c add type ethernet ifname eth0 con-name "My Connection"
Connection 'my-office' (fb157a65-ad32-47ed-858c-102a48e064a2) successfully added. IPv4 configuration method. If 'auto' is specified then the appropriate automatic method (DHCP, PPP, etc) is used for the interface and most other properties can be left unset. If 'link-local' is specified, then a link-local address in the 169.254/16 range will be assigned to the interface. If 'manual' is specified, static IP addressing is used and at least one IP address must be given in the 'addresses' property. 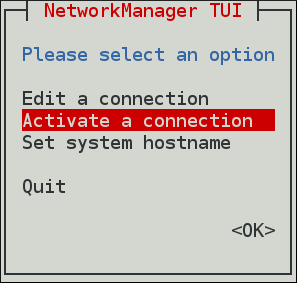 If 'shared' is specified (indicating that this connection will provide network access to other computers) then the interface is assigned an address in the 10.42.x.1/24 range and a DHCP and forwarding DNS server are started, and the interface is NAT-ed to the current default network connection. 'disabled' means IPv4 will not be used on this connection. This property must be set. Saving the connection with 'autoconnect=yes'. That might result in an immediate activation of the connection. Connection 'ens3' (090b61f7-540f-4dd6-bf1f-a905831fc287) successfully saved. Connection 'test-lab' (05abfd5e-324e-4461-844e-8501ba704773) successfully added. ~]$ nmcli con mod test-lab ipv4.dns "8.8.8.8 8.8.4.4"
~]$ nmcli con mod test-lab ipv6.dns "2001:4860:4860::8888 2001:4860:4860::8844"
~]$ nmcli con mod test-lab +ipv4.dns "8.8.8.8 8.8.4.4"
~]$ nmcli con mod test-lab +ipv6.dns "2001:4860:4860::8888 2001:4860:4860::8844"
Connection 'ens3' (704a5666-8cbd-4d89-b5f9-fa65a3dbc916) successfully saved. 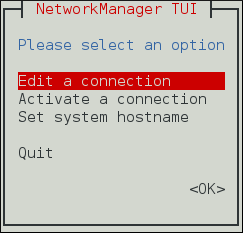 nmcli connection add type ethernet con-name connection-name ifname "*"
~]# nmcli connection modify eth0 +ipv4.routes "192.168.122.0/24 10.10.10.1"